Mattia Barbieri’s oil paintings develop the idea of Full Frontal, a dimension in which every sign is deconstructed and contaminated by the another that is superimposed on the wooden surface creating one concentrated space-time, in which coalesce a multitude of images ranging from personal experiences to popular culture, from the pictorial experimentation to art history, from traditional craftsmanship to the digital doodle. The heterogeneous and increasingly abundant visual material of contemporary life is metabolized by the artist in compositions that are intended to provide a summary, in a space that brings together frontally several perceptual dimensions. The painting is conceived as an area within which everything happens. There is not a favorite subject in the multitude of elements that appear, rather the painting is layered, it erases itself but always recomposes itself in own its entirety. In the paintings, the reflection becomes less introspective and symbolic in order to focus on the pictorial language, the perception of images and time in a contemporaneity strongly characterized by digital communication. The hierarchy between central subject and the background, typical of classical painting, is dissolved in a pictorial surface that receives the most diverse iconography and that, rotating the painting can continue to be enjoyed without losing the compositional balance. In the vision of the image, no detail draws back but each fragment advances frontally without overshadowing. 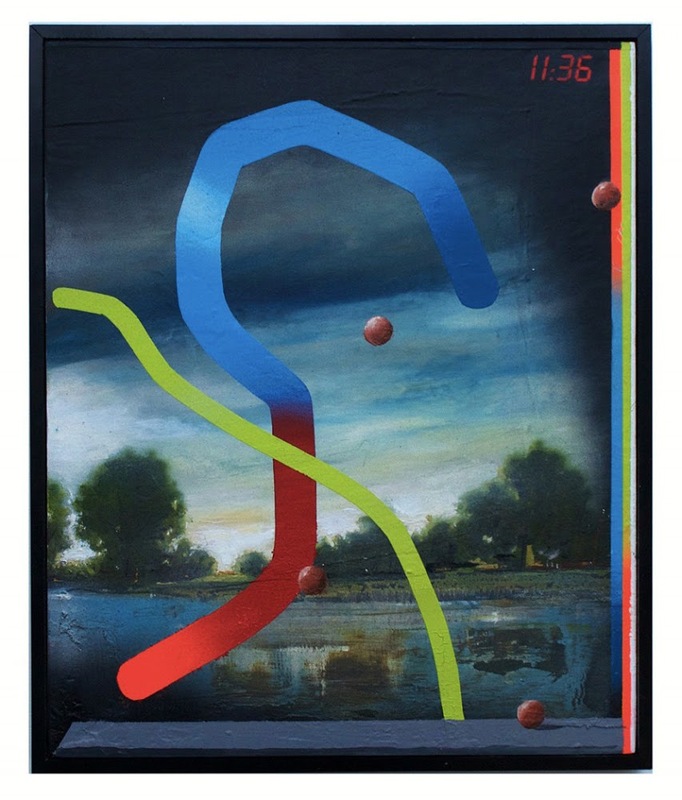 Understood by Barbieri in relation to screens of electronic devices, the paintings take on additional value related to the vision of painting as a support for a writing that records a reality that is constantly changing. Linear time is recorded by the pictorial gaze and transformed in an act that transcends past and present in an essential unity of action.